Let the adventure begin for your child in their very own toddler sized UTV Ride On. There are no limits when your child has 4WD and rubber tires. This Side X Side style vehicle also has a wide 24" seat. With custom matching leather seat inserts, perfect for 2 riders. This kids sized UTV has FM Radio and AUX/MP3 inputs, so you can listen to music right from your own library. So let them kick back in the nice leather seat, turn on all the cool lights, and enjoy the open trail! All while having the peace of mind that you hold the remote control, to stop or divert your little one from potential danger. The Trail Cat Ride On UTV has a rear cargo bed just like the real one! Allowing your child to haul all their favorite toys around. This Side X Side comes with rear spring suspension (for a softer ride) and rubber tires (for a greater grip on all terrain). Exclusive Big Toys RC Remote Control features fail-safe, so if it loses connection with the vehicle it will come to a complete stop. Features the Emergency Stop Button, when your child is driving near potential danger you can press the button for the toy to stop as well. 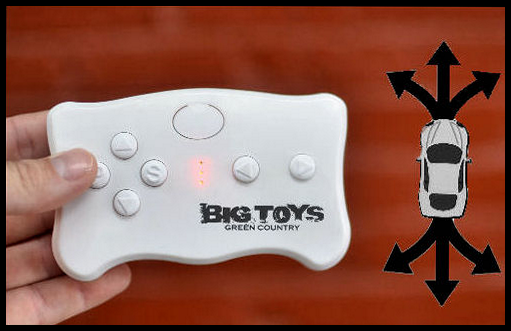 The RC remote can control speed and direction. Forward, Reverse, Left, & Right. Give your toddler control themselves using the steering wheel, foot pedals, and controls in the vehicle. OR join in on the fun, when they can not yet maneuver the vehicle themselves. This vehicle also has a soft take off feature. Letting your little ones ride in comfort, without getting knocked around. This rugged Ride On kids UTV has upgraded factory installed drive motors for higher torque, and high output 12V batteries for more speed and fun! Exclusively sold right here, NOT sold in stores or anywhere else online. The Trail cat preforms best on Hard pack dirt or rock surfaces. Shop today at www.bigtoysgreencountry.com Trail Cat 4x4 UTV 4 wheel drive Side X Side Ride On with rubber tires Let the adventure begin for your child in their very own toddler sized UTV Ride On. There are no limits when your child has 4WD and rubber tires. This Side X Side style vehicle also has a wide 24" seat. With custom matching leather seat inserts, perfect for 2 riders. This kids sized UTV has FM Radio and AUX/MP3 inputs, so you can listen to music right from your own library. So let them kick back in the nice leather seat, turn on all the cool lights, and enjoy the open trail! All while having the peace of mind that you hold the remote control, to stop or divert your little one from potential danger. The Trail Cat Ride On UTV has a rear cargo bed just like the real one! Allowing your child to haul all their favorite toys around. This Side X Side comes with rear spring suspension (for a softer ride) and rubber tires (for a greater grip on all terrain). Recently purchased for our 2 year old son. While at first you could shy away from the $500 price tag I can assure you it's worth it when compared to junk that hot wheels sells for $300. This thing will go nearly anywhere. Slow start feature is also nice, keeps the kids from being jerked around. This is not your normal kids car that you would normally find at Walmart or other big box retailers. This is a superior product, awesome looking, safe, and fun. Big toys green country took pride when designing and manufacturing a high quality electric cars and they did not compromise quality for savings in any aspects. Excellent example of American made products, and honesty I don’t know how they are producing this superior amazing cars with at this price range. If you compare this product with any other on the market is clear that Big Toys Green have in fact no competitors. My kids love it so their little friends!!! I have a 2 year old and a 7 month old. The two year old loves it. the lower gears are really slow. We set it to high and haven't turned backs. You can still walk beside it on high. It does have 4 motors. If there are on ground and one is free. Only the one gets power which isn't 4x4. It's a kids toy so we will take it for what it is. Great in high speed, underpowered in low and medium speeds. To go up small inclines (off road/grass) with my 25 pound child, you have to put vehicle in high speed. In high speed it will actually suprise you the places it will go. The remote works great. Overall a great vehicle with some neat features. Customer service was amazing, it's nice dealing with a U.S. company. Bought this for my twin grandsons after buying a store bought one for my granddaughter. The level of superiority is Amazing over the other one. Strength, gadgets, and real seat belts. Well worth the extra cost! Great ride-on for the kids! This was our first ride-on purchase and it went smooth. Product description was accurate and was shipped very fast. Assembly took less than 15 minutes since it was 90% assembled out the box. Very good construction, everything is sturdy. I live in Virginia and we have nothing close to flat ground. The vehicle went up all hills, one which surprised me since the high incline. Overall 100% satisfied. Here are some of the very few cons which really isn't bad, just figured I'd add them in for future improvements. They can still turn the steering wheel even while you control it with the remote (easily corrected with remote, I don't see it causing any dangerous scenarios since the speed isn't extreme). The instruction manual could be a bit more informative (like a charging indicator light I was looking for but realized it didn't have one). I contacted them prior to purchase for information, the customer service is great. Very happy customer and I am referring anyone who asks about the ride-on. Click the button below to add the Big 4WD Trail Cat Ride On UTV Side X Side w/ Remote & Rubber Tires - White to your wish list.